Topeng Dance is one of theatrical art form, as well as an important element in cultural tradition of Balinese. This mask performance is believed to originate in the early of the ninth century. The earliest record is the "Bebetin" manuscript, dating back to the Caka year 818 or 896 A.D. The manuscript is collected by The Gedong Kirtya Library in Singaraja, Bali. The manuscript mentioned important terms, which suggest the performances using masks, are: patapukan, atapukan, hanapuk (tapuk means "to cover" or "mask"). These terms signify masked performances in which to create a character, the dancer put something to cover the face. Nevertheless, no one knows the mask performances mentioned in Bebetin manuscript are alike to the Topeng dance theater that is growing today in Bali. Until today there are four variations of Balinese mask: Topeng Pajegan, Topeng Panca, Topeng Prembon, and Topeng Bondres. Topeng Pajegan or often called Topeng Sidakarya, performed by a solo actor-dancer. This type of mask is preferred for ritual purposes, as a sacred art (wali) and ceremonial art (bebali). Sidakarya means "to finish the task" and refers to the ceremony in process. 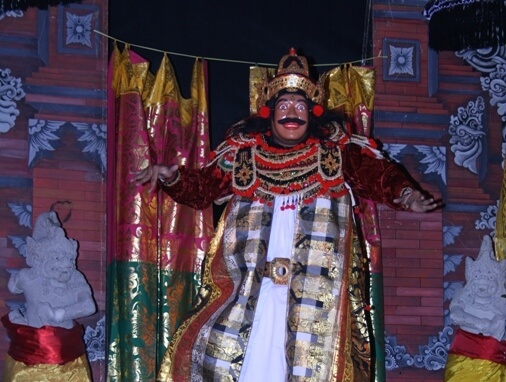 Topeng Pajengan is usually performed by a reputated and mature actor-dancer who also has priestly knowledge. Topeng Panca means topeng dance theater acted by a group of five actor-dancers or more. In the topeng panca performance, there is a division of roles where the dancers act as king, minister, buffoon (penasar), clown, etc. Topeng Prembon is a mixed topeng dance drama, featuring characters with and without mask. This topeng variant is emerged in 1942, a derivative of the Topeng Panca, combination element of topeng and the opera dance drama called “Arja”. Topeng Bondres is a topeng variant dominated by comic characters, such as clown servant and villagers. Its performance contains endless amount of spontaneous humor. Topeng Bondres is created in the early 1980s. The formal structure of Topeng dance (Topeng Pajegan, Topeng Panca, and Topeng Prembon) is composed in two main sections: the introduction or pangelembar (panglembar) and the drama story or lampahan. The characters for introduction are Topeng Keras (prime minister, strong figure with red or brown face, denoting strength and courage) and Topeng Tua (the old man). The dramas begin with the appearance of the clown servant (speaking mainly Balinese) and are the story-tellers or penasar. The penasars set the flow of the entire play and pave the way for the entrance of the King. Topeng pajegan is considered as “wali” and “bebali” dance that is traditionally performed for ritual and religious ceremony or panca yadnya. The performance normally takes place inside the temple, near the sanctuary, and within the area of ceremony. 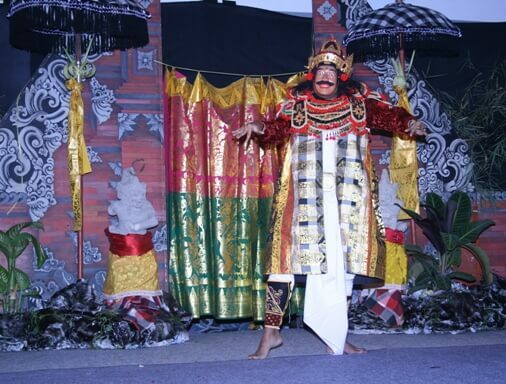 The performances of Topeng Panca, Topeng Prembon, and Topeng Bondres, are considered as “balih-balihan”. The main goal is to entertain the audience, but some time in conjunction with the religious activities. The performance traditionally takes place outside the temple, inside theater or hall, or at other places. Topeng dance incorporates various artistic elements, such as: mask, dance and acting, story-telling, gamelan music, costume, and offerings. The masks in topeng dance usually portray human face. It’s made from wood, painted, and accentuated with hair and jewelry. In Baliense, the mask is called “tapel”, derived from “tup” (which means “to cover”) literally means “to close or press against the face” or “to conceal or transform the identity” of the person who wears it. The mask for topeng can be divided into three groups: Tapel Bungkulan (full mask) which cover entire face, used by topeng keras, topeng tua, and topeng dalem; Tapel Sibakan (half mask) which cover the face from fore head down to the upper lip, used by buffoon and some of the clowns; and Tapel Kepehan (mini mask) covering only the forehead and nose, chin and the upper part of the jaw, used by a certain type of clown. A topeng performer holds his mask on face by a rubber strap around his head. The dance movements are based on “gambuh”, a form of courtly dance drama with un-masked character and have stories based on the Panji Romance. Generally, the choreography consists of four main movement categories: Agem (non-locomotive action), Tandang (locomotive movements), Tangkis (transitional action that connect agem and tandang), and Tangkep (facial expression to bring masks alive). The stories in topeng dances are drawn mostly from “Babad”, Balinese chronicles that usually written on palm leaf manuscript (lontar). For example: The journey of Javanese priest from Java to Bali; The historical journeys of Balinese ancestors; The founding of many Hindu-Balinese temple around the island; The inauguration of the local villages; The marriage of the local Kings and their royal family members; and the role or emergence of clan in Bali. The musical accompaniment in most case is gamelan “Gong Kebyar”, one of the largest gamelan ensembles and the most popular in Bali, with 25 to 30 musicians. Among the most important instrument are: vertical gongs (gong ageng and kempul), flat gong (bebende), knobbed gongs (reyong, terompong, kayar and kempli), gangsa metallophones (jegogan, jublag, ugal, penyacah, pemade and kantil), drums (kendang), cymbals (cengceng), bamboo flutes (suling), and the two-stringed fiddle (rebab). The costumes for topeng dance are based on the male characters of the classical gambuh dance drama, known as “Sesaputan”. This basic costume is composed of several pieces of cloth worn in layers. The costumes are: an ornamented split robe (saput) covering the body from chest to knee; a pair of white trousers (jaler) and a white waist cloth (kamen); a belt; a dark jacket; a pair of leggings; a decorative back panel; decorative collar; a pair of long aprons; and a pair of epaulettes. The headdress encompasses the crown-like headdress or gelungan used by prime minister, a wig (sobrat), and head cloth (udeng) for servants and clowns. Each dancer wears a dagger (keris) across his back. The offerings are also importance in the topeng performances. The performer believes that their mask poses the soul and spirit of the respective characters. They always treat the mask with profound respect, by always keeping them in an appropriate or special place. The performer also makes offerings for them, at home and at the performance site, before and after the performances. Dibia, I Wayan (2016). "Topeng: A Mask Dance Theatre of Bali". SPAFA Journal. SEAMEO SPAFA. Retrieved February 2, 2018. Dibia, I Wayan (December 2016). "Experimenting the Modern Story “Mr. Tepis” to Balinese Topeng Masked Dance Theatre". Malaysian Journal of Performing and Visual Arts. University of Malaya. All rights reserved. Retrieved February 2, 2018.